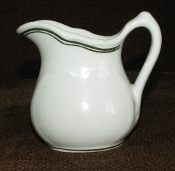 Vintage From Paul is pleased to offer this Mint condition Sterling China Vitrified Green Stripe Creamer or Syrup Pitcher. This charming pitcher is made of heavy-duty, vitrified china. It is decorated around the top edge with a hand-painted, dark green, double stripe. The style and durability of the piece are an indication it was probably used in the restaurant or hospitality industry. The bottom shows the stamp of the Sterling China Co., E. Liverpool, Ohio. The shape and proportions of this little pitcher are charming. It measures 4 -1/2 inches high and is in perfect condition. Besides being used as serving ware, it would make a charming small vase for fresh flowers on a side table or window sill.